The coast guard fleet lacks the capacity to perform its icebreaking duties. The Canadian Coast Guard ship Terry Fox, launched in 1993, is the newest icebreaker in the fleet. The federal government has signed a $610-million contract to acquire and convert three icebreakers to renew the Canadian Coast Guard's aging fleet. Federal Families, Children and Social Development Minister Jean-Yves Duclos, who represents the Quebec City region, made the announcement at the Davie shipyard in Lévis, which will be doing the work. The contract is expected to result in the creation of 200 new jobs over the next two years, according to Davie spokesperson Frédérik Boisvert. Last year, when Davie was working on the conversion of the container ship MV Asterix​ and finishing two ferries, Davie employed 1,500 workers, Boisvert said. Many of them were laid off once the projects were completed. In June, the Liberal government concluded a deal with Davie to purchase three icebreakers, but there was no price tag attached to the project at the time. Negotiations to acquire the vessels were launched in January after Prime Minister Justin Trudeau abruptly announced the plan in a Radio-Canada interview in Quebec City. That marked the beginning of a seven-month negotiating process between the government and Davie. Spencer Fraser, who headed the Asterix project for Davie, noted that the usual time it takes to negotiate a shipbuilding contract with the government is eight years and praised the work of the negotiators. MacKinnon confirmed that Ottawa sped up the process for the icebreaker deal. But an aide to the minister insisted that does not mean Ottawa will reopen the national shipbuilding procurement strategy, a long-term, multi-billion dollar commitment to renewing Canada's federal fleet. Davie was emerging from bankruptcy in 2011 when the Harper government chose Irving shipbuilding and Seaspan of Vancouver as the two main shipyards that would build ships for the navy and coast guard. During the news conference, Parliamentary Secretary for Procurement Steven MacKinnon said the government always intended for Davie and other shipyards to have opportunities to win work despite not officially being part of the strategy. He signalled that would continue to be the case. "Davie had … has had … and will continue to have opportunities under the national shipbuilding strategy to bid, to win work, and the quality of the work that's done in this shipyard speaks for itself." Fraser called MacKinnon's announcement "great news." He noted that Davie accounts for 50 per cent of Canada's shipbuilding capacity. The Asterix project was completed last year, on time and on budget. 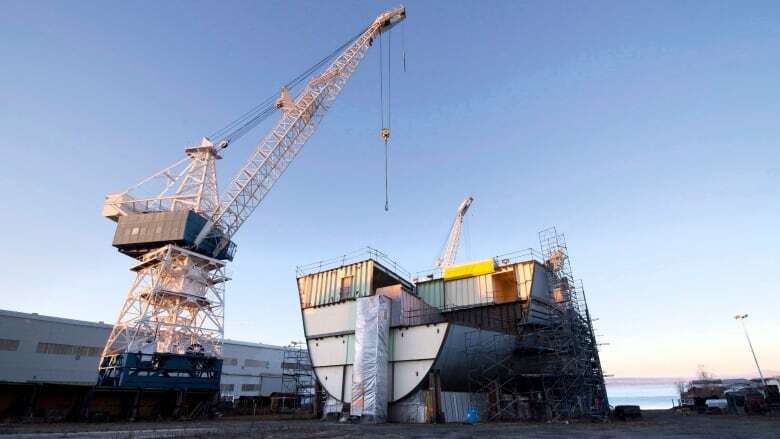 Ann Gingras, president of the union representing Davie employees, noted that Seaspan in Vancouver has not started construction of the Diefenbaker, now expected for 2023, at a cost of $1.4 billion, double the initial estimate. "At that time we were talking about four icebreakers and 800 jobs," Gingras said, calling the exclusion of Davie in 2011 "a great injustice." "We know that Seaspan and Irving haven't respected the calendar for delivery, they haven't respected the budget and it shows that the strategy is a failure." Gingras had expected a more concrete commitment from Ottawa. She said MacKinnon's announcement that the acquisition process would be opened to Davie was "the only positive point of the day." "I won't hide that this was a letdown." A previous version of this story stated the federal government is reopening the National Shipbuilding Strategy to allow the Davie Shipyard to bid on contracts. In fact, the Davie Shipyard was already eligible to bid on refit and refurbishment contracts outside the strategy.